Posted on October 1, 2010 March 4, 2015 by Sarah R.
A version of this essay appeared at http://www.hastac.org/blogs/sarahr/some-musings-labor-culture-industry on February 9, 2010. Theodor Adorno’s primary critiques in the selections brought together in Routledge’s The Culture Industry focus on what can be termed generally mass culture (or, to use the term he coined along with Horkheimer, “the culture industry”), being those artifacts which are mass-produced, reproduced, distributed – both as the means and the end to advertise, promote and consume the products. The result is that what was once the province of cultural output such as artistic expression is reduced instead to artifacts and emblems of products and commodities; this then becomes the common cultural currency. Advertising stands in for art, and cultural objects are created expressly for consumption – by necessity, as a result of their mass-production – and to generate capital. There is a flattening of the culture which, “while eliminating tension…abolishes art along with conflict” (Adorno 77). Devoid of meaning except for the most superficial, obvious and apprehensible on a large scale, the culture industry/products become a site of and for control. Adorno tells us that products of mass culture (such as sport, for example) have been used to reinforce, glorify and exalt modes of material production. Evidence of autonomy or creativity, such as in works of art, is eliminated (Adorno 99). In a recent essay, Raj Jayadev describes the modes of production that provide the objects making up the culture industry in a contemporary, digital context. The technological nature of that production, according to Jayadev, tends to mask the human labor inherent in it, rendering mythical/mystical what has gone into it, often even conflating it with the output or products themselves, such as in the case of Intel’s dancing men (Jayadev 168), rather recently rehumanized via a Super Bowl commercial featuring a chorus of happy workers humming the “Intel Inside’ tonal jingle. Is one to infer that they, too, have Intel inside? Meanwhile, that labor is standardized, reproduced and depersonalized. Like the standardized commodities themselves , their production is uniform, and like the widgets they produce, the laborers are interchangeable, disposable and cheap (Jayadev 168). While Jayadev focuses his attentions on the situation in Silicon Valley, USA, the geographical location of site of production of the culture industry bears little import; it, too, is interchangeable. In some cases, as illuminated by Fuchs and others, production may find its locus in that everywhere and nowhere with which we are all now so familiar, the digital realm decoupled from traditional space-time barriers (or, what old people like me once poetically and hopefully referred to as “cyberspace”). Fuchs draws attention again to another sort of collapsing of roles, this time between consumer and producer alongside Adorno’s culture object as means and end of its own promotion, and Jayadev’s tech-sector manufacturing laborer as producer and replaceable widget on the line. The “prosumer,” enticed by the culture industry in the digital realm, gives away his or her labor seemingly for free (Fuchs 147). 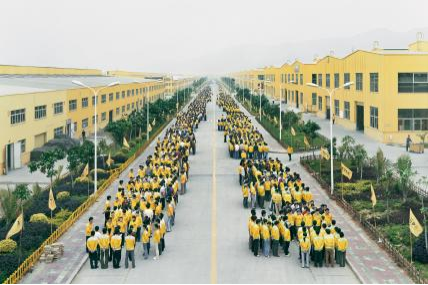 Edward Burtynsky: Manufacturing #18, Cankun Factory, Zhangzhou, Fujian Province, China. As I read these three pieces, I could not help but think of the startling opening images from a 2006 documentary entitled Manufactured Landscapes, whose epic, unforgettable first shot pans through a Chinese iron factory and row upon endless row of industrial worker clad in the same garb and performing similar, endless tasks. Where did the assembly line end and the human begin? Which object in the frame signified the fruits of the labor? What thing was actually being bought and sold? What was I using to view these images that had been generated by labor I never thought about, never saw, but was undertaken by legions and legions of people across the globe? Greg Downey calls this process of questioning the “uncovering [of digital] labor.” I like this notion and metaphor of “uncovering,” like peeling back the layers of an onion, hidden labor in digital and contemporary contexts. Adorno, Theodor. The Culture Industry. 2nd ed. Routledge, 2001. Fuchs, Christian. Class, knowledge and new media. Media, Culture & Society 32, no. 1 (1, 2010): 141-150. Jayadev, Raj. South Asian Workers in Silicon Valley: An Account of Work in the IT Industry. In The language of new media, edited by Lev Manovich. The MIT press, 2001.